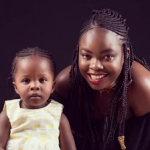 Bahati’s ex-lover Yvette Obura has yet again disclosed how things were not rosy between her and the gospel singer while she was pregnant with her daughter Mueni. On a Facebook post, Obura shared how Bahati had neglected him after getting her pregnant a thing that almost killed her. In the post, she shared how she lost weight so much because she was too weak to cook. “I hate my pregnancy period to date. First time mom, went through the knife and I was alone. I did not even know how to raise a child. One week later, my milk dried up because I was not eating.” she said. Tough Road Bahati and Mueni dated and got their daughter in their early 20s. The journey wasn’t easy for both since they had no jobs. Bahati was still a struggling singer trying to make a living. “I went back home and my mom cried. I was so pale with almost 30kgs down. I remember crying every day. I just thank God for my mom,” Yvette penned. The post Bahati’s baby mama exposes Bahati yet again: I was so pale with almost 30kgs down because I wasn’t eating appeared first on Ghafla! Kenya.